Mercer County is a county in New Jersey, United States of America. 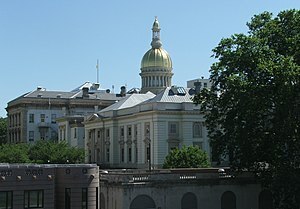 Trenton, the capital of New Jersey is in Mercer County. As of the year 2006, 367,605 people lived in the county. Mercer county was founded in the year 1838. ↑ "Mercer County "The Capital County"". County of Mercer, New Jersey. Archived from the original on March 24, 2016. Retrieved March 25, 2016. This page was last changed on 25 May 2018, at 18:28.